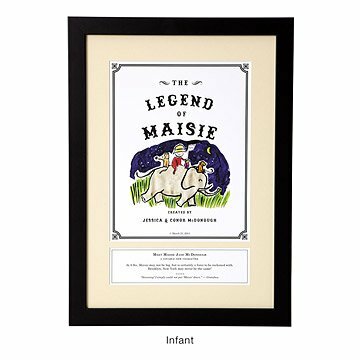 This personalized print casts your favorite child as a storybook legend. Cast your favorite little person as a legendary literary figure--whether a newborn making a debut or a young child in the first few pages of his or her legend--with this delightfully personalized print, featuring a custom, storybook-inspired illustration and your custom "review." For newborns, it's an imaginative antidote to ordinary birth announcements; for young children, it commemorates the magical story of early childhood. Customize the character to reflect your child of choice (skin tone for all, plus gender and hair options for older kids). Add parents' names as "authors" of this masterpiece and write a review of your little one's story (by you or another doting relative) to add a wry and endearing touch to the print. Charmingly illustrated by Patricia Carlin to evoke timeless storybook classics, it makes an unforgettable tribute that will transition from nursery to bedroom to grown-up keepsake. Printed and framed in BonanzaWood® frame in Portland, Oregon. For more storybook titles, check out our Personalized Storybook Art - Adventure, Personalized Storybook Art - Brave, and Storybook Art - Amazing. Prefer your art on a pillow? Take a look at our Personalized Storybook Pillow - Amazing, Personalized Storybook Pillow - Adventure, Personalized Storybook Pillow - Brave, or Personalized Storybook Pillow - Legend. Inspired by classic children's literature illustrations, our Personalized Storybook Art - Legend, illustrated by Patricia Carlin, offers creative portrayals of children as adventurous, timeless characters. Playful details like relatives' "review" of the child's debut and their birthday as "copyright" make this keepsake a truly individualized expression of a child's character, and a distinctive birth announcement or toddler tribute to be treasured for years to come. The Personalized Storybook Art - Legend is packaged in a partially recycled and fully recyclable/compostable box. There's one place—and only one place—where you'll find the Personalized Storybook Art - Legend: UncommonGoods. It's a thoughtful piece, fun to personalize. Got this for a grandbaby girl, then came her brother. The parents were hinting and hoping for another one. She got "The Brave" and he got "The Legend", both beautifully done. I have one of these for each niece, and I put them in the guest room so when they visit, it is personalized for them. They love them! I've bought this product on 4 separate occasions as gifts for newborn baby parents. Each time the parents have absolutely loved the framed "story book cover and review" as it is different or "uncommon" from other typical gifts. I was so excited to find this customized artwork on the Uncommon Goods Web site. We are out of the "baby" stage, so we were so excited when good friends of ours shared that they were expecting their first. We wanted to get the perfect gift and this was it. A beautiful tribute to a sweet baby and the parents have shared that it was their favorite gift. Thank you Uncommon Goods! I bought this for my grandson and am so excited to give it to him. I order it framed and it's perfect. It is easy to personalize and will be something that can become a family heirloom. I gave this as a baby gift to a very good friend. She and her husband absolutely loved it. My friend said, "My daughter can keep this forever!" It was clearly very much appreciated.